On November 8, 2016, Kamala Harris was elected to the U.S. Senate from California, becoming the second African American woman to sit in that body after Carol Mosely-Braun of Illinois was elected to represent Illinois 24 years earlier in 1992. Before her election to the U.S. Senate, Harris served two-terms as the Attorney General of California. She was also the first black woman and first person of color to hold elective office as attorney general of any state. Kamala Devi Harris was born in Oakland, California, on October 20, 1964 to Donald J. Harris, a Stanford University economics professor from Jamaica and Shyamala Gopalan Harris, a breast cancer specialist who immigrated from Chennai, Tamil Nadu, India. Harris attended high school in Montreal, Quebec, Canada, where her mother worked at McGill University Hospital. Harris earned a bachelor of arts degree from Howard University in Washington, D.C. in 1986. After graduation, leading civil rights lawyers Thurgood Marshall and Constance Baker Motley encouraged her to become an attorney. In 1989 Harris received a J.D. degree from the University of California, Hastings College of the Law in San Francisco, California. Three years later, she was admitted to the California Bar. From 1990 to 1998, Harris served as a deputy district attorney in Alameda County, California, where she prosecuted hundreds of violent felonies. In 1998 she entered the office of the San Francisco district attorney and became managing attorney of the Career Criminal Unit. She also headed the Division on Children and Families. Harris joined the San Francisco city attorney’s office in 2000 as chief of the Community and Neighborhood Division that oversaw civil code enforcement. In 2003 she was elected district attorney of the city and county of San Francisco, making her its first female African American and Indian American district attorney. She won re-election in 2005. During her tenure, Harris created the Environmental Justice Unit and prosecuted several individuals and industries for pollution. In 2009 Harris wrote Smart on Crime: A Career Prosecutor’s Plan to Make Us Safer in which she looked at criminal justice from an economic point of view and presented proposals to reduce and prevent crime. 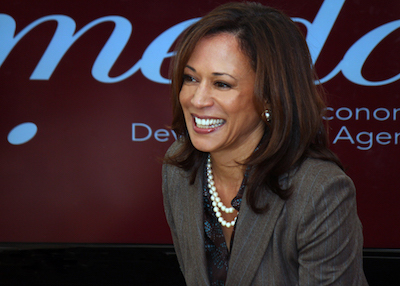 In 2010 the Democratic Party of California nominated Harris for California attorney general. She received the endorsements of many groups, including Black Women Organized for Political Action, the Mexican American Bar Association, South Asians for Opportunity, and the National Women’s Political Caucus. She defeated Republican candidate Steve Cooley, becoming the first female African American and Indian American attorney general of California. When Harris entered office in 2011, California was confronted with a mortgage foreclosure crisis. She participated in the National Mortgage Settlement against five banks, getting $12 billion of debt reduction for the state’s homeowners and $26 billion overall. She also drafted and presented the California Homeowner Bill of Rights to the state legislature, a package of reforms that gave homeowners more options when struggling to keep their homes. The legislature passed the Homeowner Bill of Rights. Harris was re-elected to a second term in 2014. Harris announced her candidacy for the U.S. Senate in 2015. She defeated U.S. Representative Loretta Sanchez, a fellow Democrat from Orange County, in the general election. Kamala Devi Harris is married to Los Angeles attorney Douglas Emhoff. On January 21, 2019, Senator Harris announced that she will run for President of the United States. Jason B. Johnson, “San Francisco/D.A. creates environmental unit/3 staff team takes on crime mostly affecting the poor,” San Francisco Chronicle, June 1, 2005; Kerry-Ann Hamilton, “Howard Alumna Becomes First Woman Elected as California Attorney General,” University News, December 14, 2010, Howard University, News Room, www.howard.edu; Barbara Parker and Rebecca Kaplan, “Kamala Harris’ foreclosure deal a win for the state,” San Francisco Chronicle, March 5, 2012; Michael Finnegan, “How Race Shaped Kamala Harris’ Politics,” Los Angeles Times, September 30, 2015, "Kamala Harris is Elected California's New U.S. Senator," Los Angeles Times, Nov. 9, 2016. 30, 2015, “Kamala Harris is Elected California’s New U.S. Senator,” Los Angeles Times, Nov. 9, 2016.